To stay healthy, don’t put toxins into your body or anyone else. Take large enough doses of needed nutrients so that your body flushes toxins, and the excess nutrients. Stop micromanaging yourself and put your body in charge. You don't need to do anything else except wash your hands. Sick people are toxic people. Toxins cause us to loose needed nutrients, lowering our natural immunity. I propose to you that the Parke Davis Phylacogen business laid the ground work for the Spanish Flu of 1918-1920, killing more than 50 million people. This is the Journal of the American Medical Association from 1913. This is a discussion about Parke Davis’s Phalacogen scam. People who cared could see the scam coming. An excerpt of an article critical of Parke Davis (Pfizer) and their Phylacogen scam. Here is what is being sold to druggists in 1913. 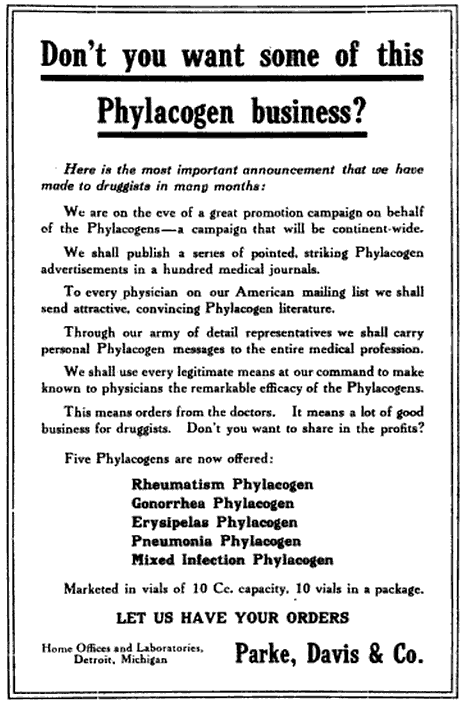 "The publicity being given Phylacogen at present, and certain claims which have been made that the administration of Phylacogen is without danger, seem to demand the publication of the following case:"
The ground works is laid out for the Spanish Flu by the use of Phylacogen vaccinations. In 1914 soldiers are being vaccinated with Typhoid Phylacogens. Oxford et al (2002, 2005) have suggested that the beginnings of the pandemic occurred in the British military base at Étaples, situated in the north of France (Department of Pas-de-Calais). This military base, which was quite important throughout the First World War, was occupied by 100,000 soldiers within a space of 12 km2. The base was situated near sea marshes with abundant migratory birds. Nearby, there were many farms with pigs, ducks and geese reserved as food for the soldiers, and horses which were used as a means of transport. Incredibly, The American Cancer Society never talks about toxic mercury and cancer.